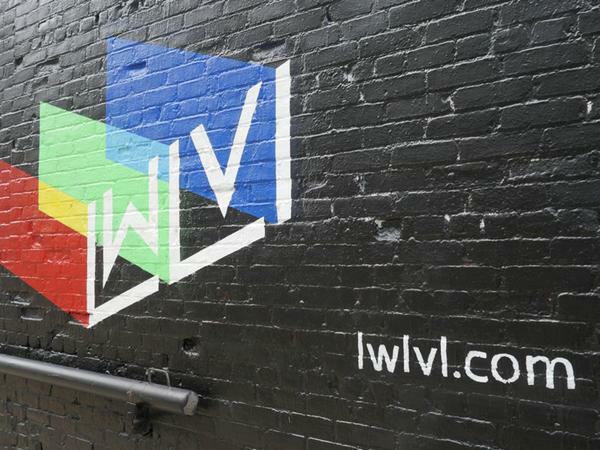 The Marimba Automaton was commissioned by the lwlvl Festival in August 2014. 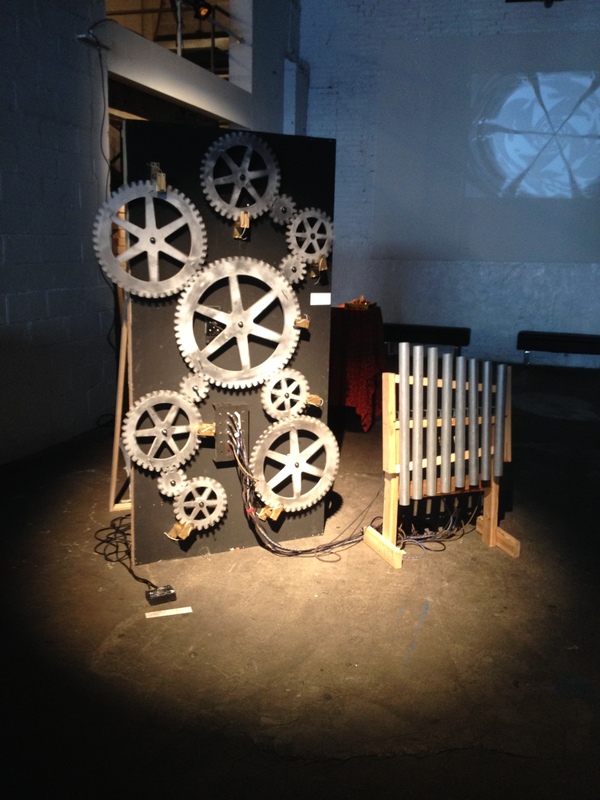 It is an autonomous, polyrhythmic marimba driven by large wooden gears. I was inspired to build this after thinking about how rhythms could be thought of in circular patterns, and how different size circles could produce loops of varying lengths. While teaching at Brooklyn International High School, I worked with Lindsay Hubert to design a Max/MSP patch based on the following video, to help students understand polyrhythms. I had been working with mechanics and motors for some time, and I thought it might be an interesting challenge to try to reproduce something like this without using a computer or any sort of digital output. I had already had a 4x8 flat left over from a music video shoot, so I set out to design the gears. 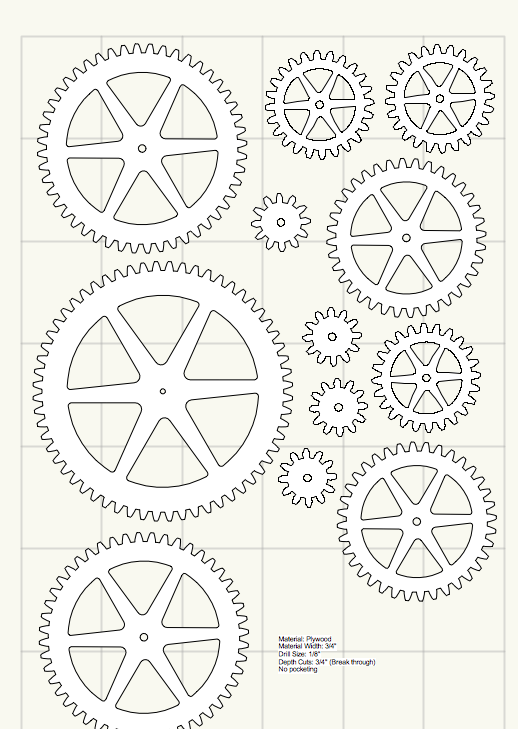 I used the gear generator in Vectorworks to design 12 gears of varying sizes. I created four 12-tooth gears, three 24-tooth gears, two 36-tooth gears, two 48-tooth gears, and one 60-tooth gear. Since each of these was a multiple of twelve, the rhythm would sync every twelve rotations of the largest gear. I had these gears cut from 3/4" plywood at Southside Design and Building. I decided to use the 60-tooth gear as the drive gear, and drove it with a 50 RPM geared AC motor attached to a 5:1 pully, meaning it would rotate once every 6 seconds (10 RPM). This would make the tempo something like 50 beats per minute (the 12-tooth gears would rotate once every 1.2 seconds). I mounted the gears using threaded rods, threaded mounting plates, and shaft collars to keep them from moving back and forth. I had to attach 2x4's to the back of the flat to provide anchor points for the rods, as the front of the wall was too thin to support the weight. As each gear was mounted, I turned the motor on to ensure the motion was correct. After all twelve gears were mounted, it was time to install the percussion. I had originally intended for the entire piece to be a single, freestanding wall. However, I soon discovered that my gear mounting took up a majority of the free space, and that I'd need to come up with an alternate plan for my percussion. I decided to mount reed switches on my wall, and trigger solenoids on a separate structure using 1/4" guitar cables. There was a crate full of junk cables lying around Death By Audio, so it wouldn't cost me much extra to do it this way. I bought 36-volt solenoids from Sparkfun to strike my percussion. I read that they would work with as little as 12-volts, and since I had some experience with ATX power supplies, I decided to use the reed switches to send a 12-volt pulse through the guitar cable to the solenoid. I mounted a few wooden dowels to ensure that my switches were in the correct places. These were later changed to 3" screws when I discovered that the force on the gears was enough to break some of them. Then I needed to figure out my percussion. 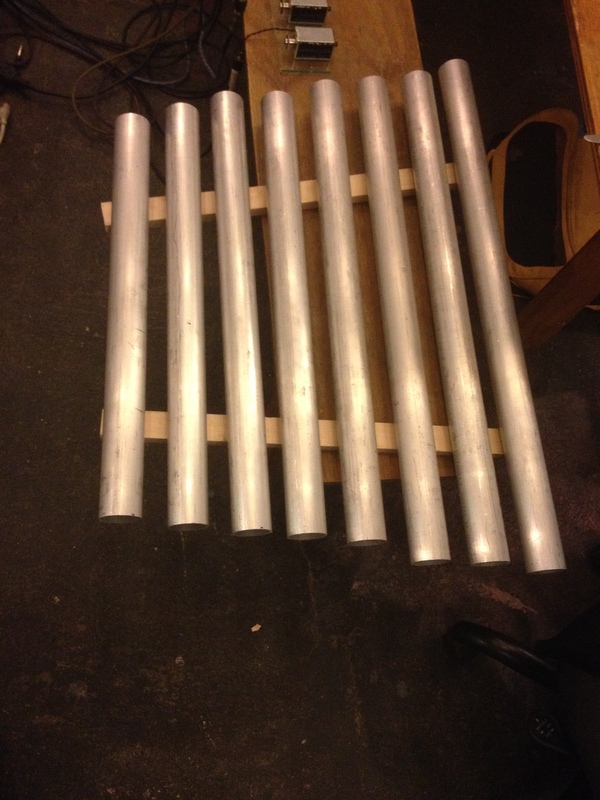 My fellow Beam Center teacher, Brett Van Aalsburg, offered up some scrap aluminum pipe he had lying around his metal shop in Redhook when I mentioned that it might be interesting to try to build a marimba. So I decided to take him up on this and cut some pipes. The equation for determining the length of a pipe based on a given frequency is f=A/L^2, where f is frequency, L is length, and A is a constant dependent upon the material, thickness, and diameter. Much of the research from this came from an excellent Instructables article. We cut a sample length of aluminum, and I downloaded a guitar tuner app for my phone so I could determine the frequency. With these two numbers, we were able to calculate the constant A for this particular aluminum pipe. Using A-400 Hz as my base frequency, I decided to cut an A-minor scale from 440 to 880 Hz. Based on logic from the same Instructables article, I had to mount each pipe on its node, or the point at which it vibrates least. This point is 22.4% of the length from each end. I drilled self-tapping screws through a 1x2 and into each pipe, and then mounted the two boards to a wooden truss. I laser-cut a mount for my solenoids, and pressed it up against the back of the pipes so they would strike the pipes more or less in the center. I discovered that I could change the notation by rearranging the 1/4" cables on the patch bay on the wall or behind the solenoids. However, in order to change the actual rhythm I'd need to add or remove screws. I decided that this rhythm would suffice for the exhibit. The piece is currently on display at Death By Audio and will hopefully be featured in a few upcoming shows in 2014. Eric Hagen was instrumental in helping to design the mounting structures for the gears. I'm sure everything would have seized immediately if I didn't consult him first. He was also the one who suggested an AC geared motor, rather than a DC stepper motor, for reliability's sake. I can't thank Brett Van Aalsburg enough for helping me to cut aluminum pipes on a Friday night after a full week of teaching 10-year olds at Beam Center. I know how exhausting that must have been.